Packing the 'Homeless Kits" with the Sunday School. St. Paul's is located on Communication Road (Hwy. 40) about 7 km. from Chatham, Ontario. 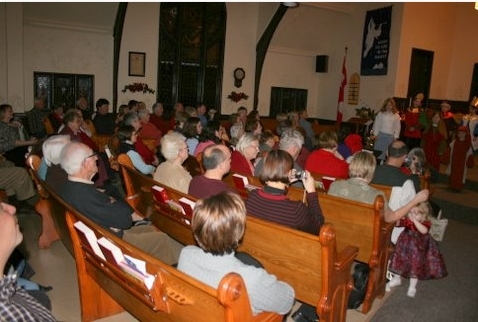 Regular Sunday worship is held at 11 a.m. with about 55 adults and children in attendance. Each Sunday the children enjoy being included in the initial part of the service then, after a brief time with the minister, they retire downstairs for the remainder of the time for a program suited to their ages which includes songs, stories and activities. The sanctuary, which holds up to 160 people, and part of the current hall were built in 1892 and the hall was expanded about 30 years later forming the current large Sunday School hall plus a full basement with a complete kitchen. A sound system is installed in the sanctuary and is used each week during our church services. We are blessed with one of the best choirs in the area. Most Sundays there are 12 singers in the choir which offers both an Introit and an Anthem. 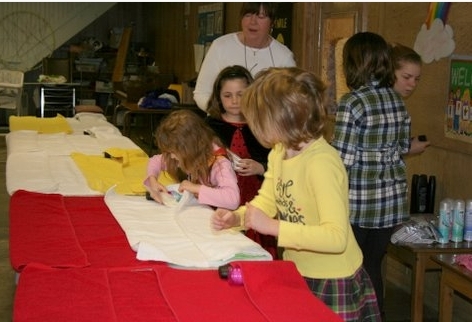 There are 16 children enrolled in the Sunday School with enthusiastic teachers. The Sunday School often takes part in worship and periodically shares its musical talents with us as a group and individually. The Men, in the past, have put on a yearly barbecue which was well attended, and they still cater a couple of suppers each year. They also help the UCW when needed. There is a very active UCW. with an average attendance of 12 at the monthly meetings. They do a great job of outreach for the church in many ways, including “homeless kits” for the Salvation Army and home made cards that are sent each month to our shut-ins and students away from home. for the Canadian Foodgrains Bank. 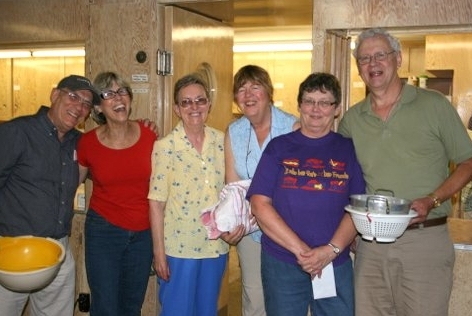 St. Paul’s continues to play an active role in the lives of its church members as well as members of the surrounding community. 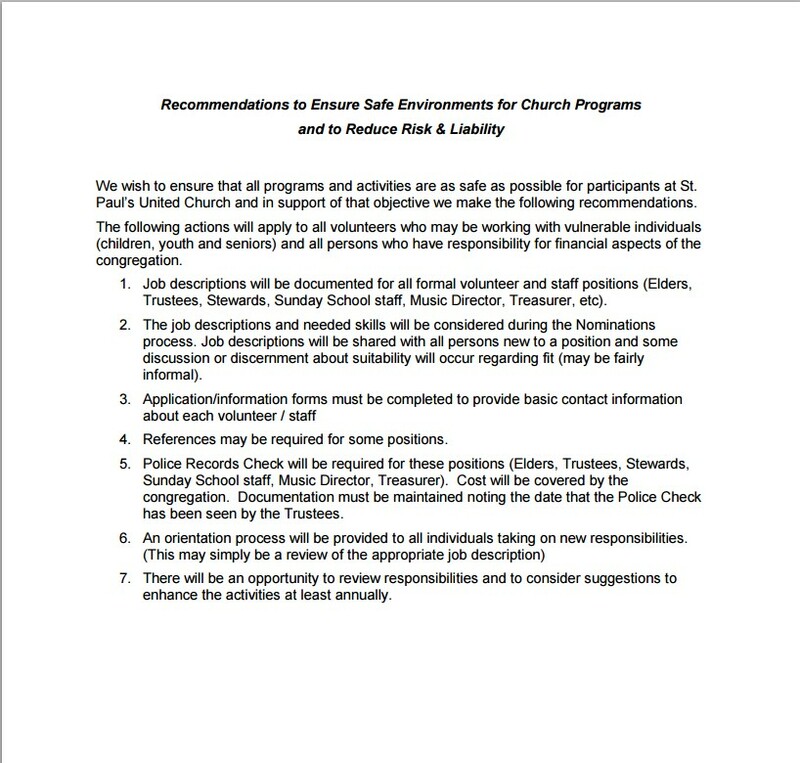 St. Paul's has several policies in place as per The United Church of Canada to ensure the safety and well-being of each individual. Click on each policy to read it. If you would like to see events that have happened in the past at St. Paul's U.C., click here.